UCLA researchers have produced the clearest 3-D images to date of the virus that causes cold sores, herpes simplex virus type 1, or HSV-1. The images enabled them to map the virus' structure and offered new insights into how HSV-1 works. "We've known that HSV-1 can hide inside the nucleus of the nerve cell and establish life-long latent infection inside most of us," said Xinghong Dai, a UCLA researcher and the study's first author. "But it was unclear how the virus travels from the nucleus of a nerve cell, along the long projection called the axon, and to the skin surface where the sore occurs. 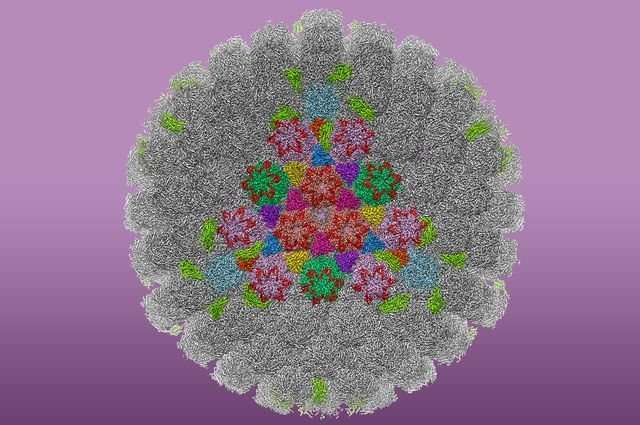 This is the first time we've seen how those cellular transport vehicles could bind to their cargo, the HSV-1 capsid ― the protein shell of the virus." The study's senior author is Z. Hong Zhou, director of the Electron Imaging Center for NanoMachines at the California NanoSystems Institute at UCLA, and a professor of microbiology, immunology and molecular genetics. "The virus enters and hides inside our neurons in a dormant state, and activates to cause cold sores when our body becomes weak," Zhou said. "These tegument proteins are involved in transporting the virus inside neurons to our lips to enable active infection." "But at lower resolutions, we didn't know exactly what those molecules were until now," he said. "Now, we are 100 percent sure." Because the capsid-associated tegument complex, or CATC, has unique characteristics compared to those in the other subfamilies, it likely plays a critical role in HSV-1's unique life cycle. By understanding the steps of this cycle through the structure, Zhou and his team gained deeper insight into how the virus infects, travels and persists in nerve cells. The 3-D image gives scientists an important new tool that could help point the way toward the discovery and design of antiviral medications and new treatment options for people with recurring cold sores.